Louie said that the key to having a great relationship with God is found in this verse. If God is really the Lord of our lives, then the only response we can give when He calls is the one Isaiah gave: yes. 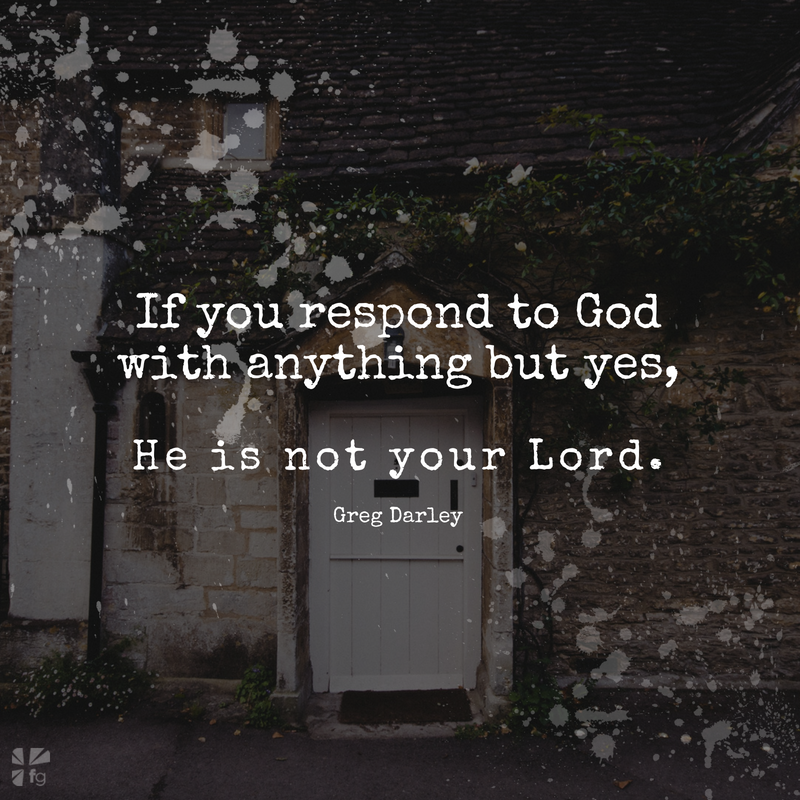 If you respond to God with anything but yes, He is not your Lord. To get off the Religious Cycle of procrastination, you must take action. Sometimes people say yes to huge, crazy calls from God, while others say yes to simple, mundane chores. Many times when God calls us to act, He’s more concerned about obedience than He is with the size of the task. Unfortunately, this is one of the main reasons many tasks are ignored — because they’re not actions that will receive the attention and recognition we often desire. In one sense, it’s completely understandable. Would you rather be remembered as the delivery boy or the superhero? If God is giving us an option, we would most likely all vie to be the superhero. But often the road to saving the day must first be walked as a delivery boy. King David’s résumé was pretty impressive (with a few exceptions). He was a military hero. He killed a literal giant without a sword. After victories in battle, the people would line the street and chant his name. He expanded the kingdom of Israel to its largest reach. He killed bears and lions with rocks. He was a man’s man. Considering his accomplishments, one would assume that he must have come from an affluent background, where opportunities for learning and achievements were unending. But that’s not the real story. David came from humble beginnings. He was born last of eight sons, at a time when being the oldest was the main ingredient for success. The odds of David succeeding more than his brothers were miniscule. We learn in 1 Samuel 16 that the Lord sent Samuel to find and anoint the next king of Israel. Samuel went to the house of Jesse, David’s father. He assumed exactly what everyone else assumed — that he would choose the oldest son. But the Lord told Samuel that Eliab wasn’t the one. Jesse called his next six sons to stand before Samuel, who reached the same conclusion. None of these were chosen as king. Samuel asked if there were any other sons, and judging from Jesse’s response, it was obvious that not even he thought David would be worthy. Surely you can’t pick the youngest son, Jesse was implying. He’s not old enough. He’s not in the army. He’s no warrior. He’s just tending my sheep. They’re not even his own sheep. He’s too young to own sheep. Surely, this is a waste of everyone’s time. If you’ve ever felt as if you weren’t worthy of a task or calling, then take encouragement from what happened next. Defying all odds, David was anointed king, chosen over all his brothers. We don’t see David wrestling in prayer over this decision. Being obedient had never been easier. But what’s interesting is what happened immediately following David’s anointing. Five verses after Samuel left, David was called to play the harp for Saul, the existing king whom David would one day replace. Can you imagine how David must have felt sitting there, watching Saul sit on his throne each day? He knew he was going to be king, but instead of ruling, he sat at the feet of the existing king playing cover songs on the harp. Some time later, Israel and Saul were part of a war, so David went back to his old job of tending sheep. David’s oldest brothers were allowed to fight with the army, but David remained behind to tend the herds. How does one stay obedient to God’s call when all the tasks at hand seem insulting and below the call of God? Here was David, the next king, and he was working in fields and playing the harp for the current king. How did he remain obedient? He answered with a small yes every time God called. The first small yes was to play the harp. When King Saul summoned him to Jerusalem, David may have thought that his coronation was at hand. Upon arriving into town, however, David learned he was to be on call to play music anytime the king wanted to hear it. Not the welcome David was expecting. So for some amount of time, David continued to go back and forth from tending his father’s sheep to playing music for the king he was to one day replace. That was David’s life. During this time, the Israelites went to war with the Philistines, which would be the tipping point for David’s career. As the army marched to the battle lines, David as usual was back in the fields, herding sheep. One day, David’s father called him in from the fields with an urgent task. “I need you to go to the battlefront,” he said. David had to be thinking, You’re kidding me! After he was anointed to be the next king of Israel, all he had done was tend sheep and play the harp, and now he was to be a delivery boy. But David recognized the principle of the small yes. Saying yes to those small tasks was ultimately what put David in a position to accept the call of God. That’s the great benefit of the small yes. David said yes, and this put him in the right place at the right time to fulfill his calling. So David set off with the food for his brothers. Upon arriving at the battle, David learned that no one was willing to fight the giant Goliath. It’s interesting to me that David didn’t get overwhelmed with the task, perhaps because it wasn’t anything he hadn’t seen before. The giant was just like the bear or lion that he had routinely killed in the fields. So David’s small yes to being a shepherd was preparation for his becoming a military hero. David marched down to face the giant, confident that the Lord was with him and that his preparation was enough to win the battle. The reality is that if David hadn’t been obedient with the small yes, he wouldn’t have been able to step up and kill Goliath. Had he not killed Goliath, he may not have been catapulted to the top of the army and the entire nation. A lot hangs in the balance of our small-yes opportunities. Besides seeing David obey the principle of the small yes, we see that he followed with a continued yes. David didn’t just say yes once. Anyone can do that. It’s easy to show up one Sunday morning to work the nursery, but showing up every week for three years demonstrates commitment. It’s easy to go to the gym once, but going three or four times a week for months takes work. That’s what we see with David. He continued to be obedient to the menial tasks that God put before him. The continued yes is essential for long-term success and faithful obedience. Maybe you can relate to David. Maybe you feel called to slay giants, but you spend your time being a delivery boy. Maybe you feel called to be the CEO, but you work in the mailroom. Maybe you want to be the senior pastor, but you’re working part-time with the youth group. Maybe you want to run the restaurant, but you’re washing dishes. Take encouragement from David’s story. By doing the menial tasks, you are setting yourself up to one day fulfill your calling. Excerpted with permission from Wasted Prayer by Greg Darley, copyright Greg Darley. Sometimes our prayers don’t sound like words, they look like action. When God says “No”, what do we do? When He says “Not yet”, how well do we wait? When He says “Yes”, how fast do we move to respond? Come share your answers with us on our blog! We want to hear from you! Greg is a mobilization and idea consultant, social entrepreneur, speaker, and author of 3 books. In his latest book, Wasted Prayer, Greg continues to challenge people to boldly pursue their dreams and callings. He is also the author of Passion Is Not Enough, Jump Start Your Dream, and occasionally writes articles for Relevant. Most of his time is spent launching new ideas and training leaders.